"And they did fall down at the feet of Jesus, and did worship him." Proskynesis was also known to the ancient Israelites.5 For instance, in Joseph’s dreams, his brothers’ sheaves and also the sun, moon, and stars paid homage to him. This prompted his father to ask, “Shall I and thy mother and thy brethren indeed come to bow down ourselves to thee to the earth?” (Genesis 37:10).6 Psalm 95:6 reads “O come, let us worship and bow down: let us kneel before the Lord our maker." In what can be seen as an act of proskynesis to His Father, Jesus Christ Himself submissively “fell on his face, and prayed” while suffering the agonies of the atonement in Gethsemane (Matthew 26:39). He also washed the feet of His apostles in an act of humility and service (see John 13:4–16). Those who fall at the feet of Him who “descended below all things”18 and “kiss his feet … [and] bathe his feet with their tears,”19 show their willingness to follow His example of service, humility, and obedience. 2. Bowen, “They Came and Held Him,” 68. 4. Bowen, “They Came and Held Him,” 66. For a treatment of throne-theophanies, see Blake T. Ostler, “The Throne-Theophany and Prophetic Commission in 1 Nephi: A Form-Critical Analysis,” BYU Studies 26, no. 4 (1986): 67–95. 5. See Bowen, “They Came and Held Him,” 69–73. For an analysis of ritual prayer (including prostration) in Islam and its relationship with Judaic prayer, see Khaleel Mohammed, “The Foundation of Muslim Prayer,” Medieval Encounters 5, no. 1 (1999): 17–28. 6. See Brent D. Shaw, Bringing in the Sheaves: Economy and Metaphor in the Roman World (Toronto, ON: University of Toronto Press, 2013), 398 n. 44. For a treatment of Joseph, the son of Jacob, as a type of Christ, see Andrew C. Skinner, “Finding Jesus Christ in the Old Testament,” Ensign, June 2002, online at lds.org. 7. Bowen, “They Came and Held Him,” 73–88; Stuart Bevan, “Proskynesis in the Synoptics: A Textual Analysis of προσκυνέω and Jesus,” Studia Antiqua 14, no. 1 (2015): 30–43. 8. In addition to the examples of the tree of life and King Benjamin’s speech, numerous instances of proskynesis can be found in the Book of Mormon. See Matthew L. Bowen, “And Behold, They Had Fallen to the Earth”: An Examination of Proskynesis in the Book of Mormon,” Studia Antiqua 4, no. 1 (2005): 91–110. 9. Bowen, “And Behold, They Had Fallen,” 96. 10. Nibley, An Approach to the Book of Mormon, 304. 11. To review the Egyptian letter, see note 2. 12. Bowen, “They Came Forth and Fell Down,” 118. 13. See Book of Mormon Central, “Why Did Mormon Say the Children of Men are Less than the Dust of the Earth? (Helaman 12:7),” KnoWhy 183 (September 8, 2016). 14. Bowen, “They Came and Held Him,” 82. 15. Isaiah 63:3, cf. Doctrine and Covenants 76:107; 88:106; 133:50. 16. 3 Nephi 11:14, cf. Doctrine and Covenants 6:37. 17. Isaiah 52:7, cf. Mosiah 15:15–18; Romans 10:15; 3 Nephi 20:40. 20. 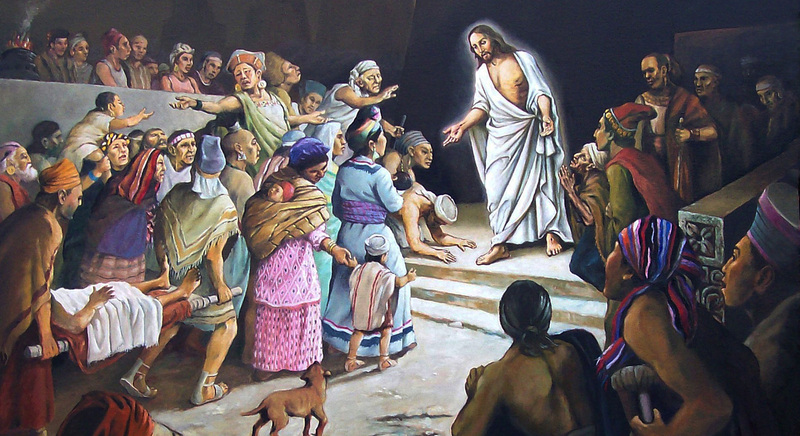 Neil L. Anderson, “What Thinks Christ of Me?” Ensign, May 2012, 114, online at lds.org. 21. Neal A. Maxwell, “‘O, Divine Redeemer,’” Ensign, November 1981, online at lds.org.